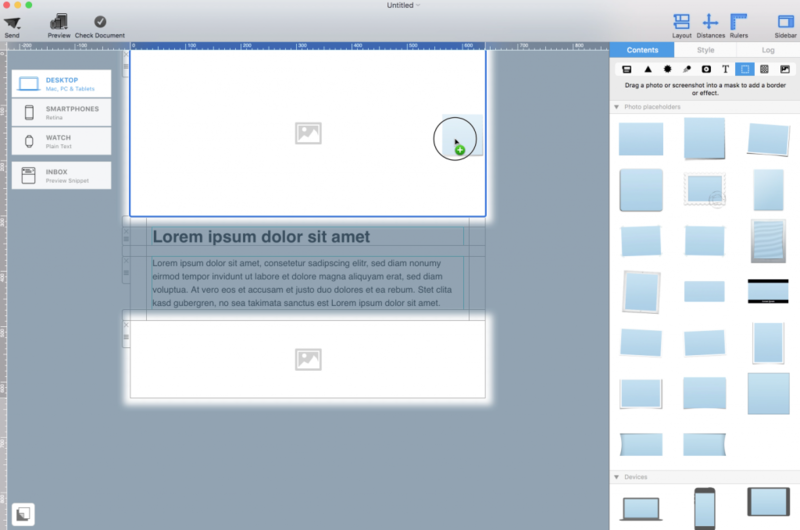 For greater flexibility, Mail Designer 365 also includes masks that can be used to crop or resize a picture. You also add different frame designs and masking effects. Open the Masks tab in the Content section. Mail Designer 365 includes plain placeholders, framed placeholders and even masking effect placeholders, like the t-shirt or flag designs. Pick the placeholder style that you would like to use and drag it into your design. You’ll notice that Mail Designer 365 has highlighted the image areas again, so you know which areas you can add your placeholders to.